I got really annoyed in the end and emailed Mike Foster, (Worcesters MP) about the trash build up. It has also been in the papers anyway as there was some sort of Regatta thingy at the weekend and the boats had issues with not getting under the bridge because of the trash. So today I got a reply of Mr Foster saying that clearing of the debris had started. I should imagine it has more to do with pressure from the rowing club than an email from little me but hey they did something that’s all that matters. I was witness to my fourth earthquake last night. I must be getting a veteran as when I was shaken awake, (well a bit of an exaggeration). I turned to Rob and said “is that another earthquake?” Which is in stark contrast to my actions during the Dudley Earthquake, (5.0 on Richter scale) admittedly we were only about 20 miles from the epicentre on top of high ground in a timber-framed building but I thought somebody had dropped a bomb on Birmingham. I was contemplating getting under the bed to shield myself from some sort of nuclear fall out. When the house stopped shaking Bob got out of bed and looked out of the window towards Birmingham but no glowing sky or anything unusual. He finally said it must have been an Earthquake. I wasn’t sure if I believed him but went back to sleep anyway. When I came into work this morning it seems it didn’t make it as far as Herefordshire as nobody I have spoken to felt it at all. How disappointing. When we lived in Queesntown in 2002 there was a small quake, (about 3.5 I think) but it was directly under Queenstown. It was actually quite dramatic. It felt like somebody had sneaked up behind me and shoved me in the back as I fell forward a couple of paces. Bob was in the shower at the time and almost fell over too. My initial thought was somebody had driven into the flat but after checking this out I decided it was a quake. It must have been a different sort of wave. I should really know what type as I did unstable landscapes module at Uni but all I can remember is laughing at Love Waves. Bishops Castle, 1990, (about 5.1 according to BBC). I was at school in a German lesson. It just felt odd, we though the lesson below us was leaving early as we could here the chairs scraping across the floor. It just felt sort of shakey, brilliant description. Then we looked over at the 6th form college across the playing field. They had evacuated the building. I think it was the last lesson of the day, I went home and my mum and dad had felt it much more up on the hill where we used to live. So that’s it. I probably also felt the North Wales, (1984, 5.4 on Richter) quake but was too young to care or remember it. I also thought the Buncefield explosion was an Earthquake. I was at Uni in Silsoe at the time, so probably about 20 miles away in a straight line and heard this shudder. I thought a another wall had fallen down at Silsoe, (this is why the college eventually relocated to the main campus at Cranfield as walls kept falling down). It was the weekend so Bob was there, asleep on the floor. He didn’t wake up. It was about 6 in the morning and I couldn’t back to sleep. As soon as he woke up I told him about the big shudder. He is forever hearing about my night time imaginations so just said that’s nice dear. We were going to see the Foo Fighters that evening in Brum. My mate knocked on the door to tell me that the motorway was shut because there had been an explosion. It still didn’t click. We went over to the computer room to check the traffic reports later and found out just how big this explosion had been. One of my mates said it had woken her up at 6 in the morning, click! I miss my girls. I hardly ever see them anymore and when I do it’s indivdually. I need to organise something soon. The last time we were all together was my wedding. Myself and Fat Bob are going on holiday with Sarah and Lisa soon so that’ll be nice. I’ve been trying to arrange to meet up with Mer loads but our social lives keep clashing. And as for Smally, she has proper responsibilites now so I feel a bit strange asking her out for a night on the lash. But that’s what I need. Obviously I still go out and have some drinks with friends and it’s great but Smally is very special to me, I sometimes feel like I have a part of me missing. She has obviously been having the same thoughts. Last time I went around to see her I was pottering around in the kitchen helping her with something and I just happened to say a bit of dizzy line, a jackieism Bob calls them. She just hugged me and said I’ve missed you. I’ve missed you too. I probably see you once a month. We used to spend every evening together, talking rubbish. That’s what I miss. If I see you every month we feel the need to catch up and talk sensibly. Let’s go out have a couple of bevvies and talk rubbish. Myself and Fat Bob wandered into Worcester at the weekend to do a spot of shopping. On the way back we came over the main road bridge instead of the footbridge as we had to go to the grren grocer in St-Johns. 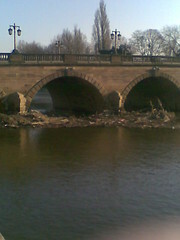 I’d noticed some of the trash build up on the arches before but was totally shocked by how much was there. The build up had started during the floods back in Januray and still hasn’t been cleared. The result is one of the arches is all but blocked. This is a tremendous flood risk. If there were to be a big storm the bridge would only be able to convey water through the remaining arches and so water would back up upstream maybe causing the demountable defences to over top. This is providing of course they had been deployed. The channel has been narrowed so much by the trash that the back up could happen with a relatively small storm comapred to those we have recently and so may take the ‘experts’ by suprise. Anyway, I whipped out my phone and took a couple of shots, I sent them to my boss who was also shocked. 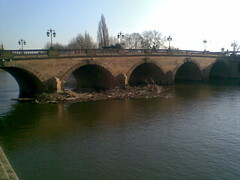 I told him aboiut the hoo ha back a couple of years ago when the Envrionment Agency had refused to clears some trash saying it was the Highways Agency’s job as it was their bridge, the Highwyas Agency had told the EA to get stuffed. The fire brigade ended up clearingthe trash but made it know they wouldn’t want to be making a habbit of it. So now the trash sits there and is buidling up with every day that passes. My boss has forwarded my photos to the dude in charge of water resources at Midlands region EA, lets see if anything happens. I’ve had a most enjoyable weekend. Let me tell you about it. On Friday evening Dev and KP turned up to pick us up and take us down to Portsmouth to see Spex. Off we toddled down the various motorways southwards. There were a couple of rather hairy moments. I think it is safe to say that Dev should not eat crisps while driving as he seems to get the packet stuck on his hand and whilst trying to remove it tends to leave the lane he is driving in. We got there nice and quick and without any wrong turns, well ok one but that was my fault telling Dev to turn into the road before Spex estate. We arrived at the executive penthouse apartment, (which is stunningly similar to a top floor flat) at about 7.30. It seemed rude not to start on the vino. So we sat gossiping and catching up whilst marvelling at the stupidly large TV in Spex front room. 42 inches apparently. It is such a boys flat, they have a 42 inch TV and no curtains! Anyway, what was supposed to be an early night didn’t happen but never mind. We popped up to thier ‘local’. The George, which aint that local but is the closest decent pub. Everyone moaned about the walk but as I hadn’t bean for my Friday evening run I felt quite energetic. We were all up bright and early, (maybe due to the lack of curtains) and Spex knocked us up some tasty bacon sarnies. Then we played the shower game, which unfortunately isn’t as dirty as it sounds. It involves taking advantage of Spex and Jims, (Spex flat mate) ridiculously expensive sound system installed in the flat. Basically you can turn speakers on in any room and play music or the TV or whatever through them and as the controls for the bathroom speakers are on the outside when you are in the shower you are at the complete mercy of whoever is joyously torturing you. Jim has some awful CDs so I was forced to listen to James Blunt followed by the Ordinary Boys, yuk! Bob got some cheesy pop off a Now That’s What I call Music album. We made Spex listen to Celine Dion very loudly. Whilst we were all bustleing around getting ready to leave Spex accidently tripped over his own jeans and fell over the back of the sofa rolling dramatically onto the floor. I think I was the only one that noticed but it made me titter somewhat. 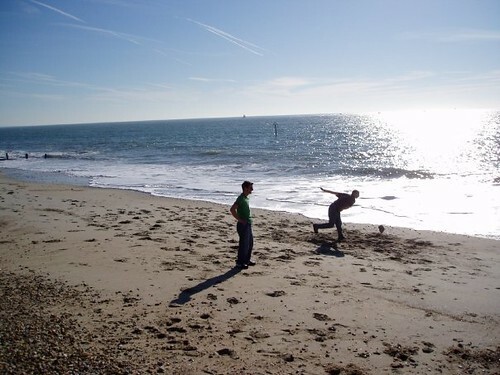 After the shower game we headed off to Hayling Island to play beach cricket. It was just such a stunning day. We found a nice empty bit of beach and the cricket ensued. Unfortunately as the sea made up the entire southern border of the wicket it was always going to be an interesting game. Especially as Bob is left handed and had to fight the natural urge to wallop the ball into the sea. 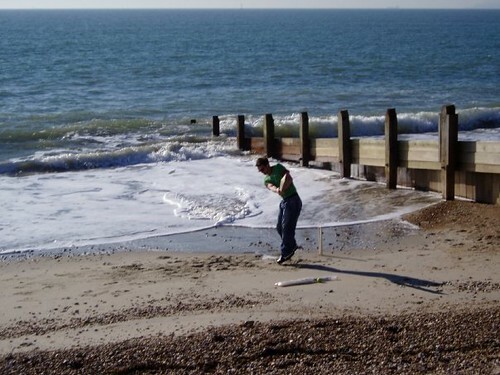 But still it happened a number of times, we had to keep using the bat to rescue the ball from the waves. That, as well as fending off the dogs that were very interested in our cricket ball. Oh and all of this going on whilst the tide was coming in. It was just a bit British we weren’t going to let a little thing like the English Channel slowly creeping up on us stop out little game. Spex even went as far as building some informal sea defences when he was into bat. Unfortunately these filled up with water at one point and he ended up stamping in the small retention pond he had constructed soaking his foot and missing the ball. 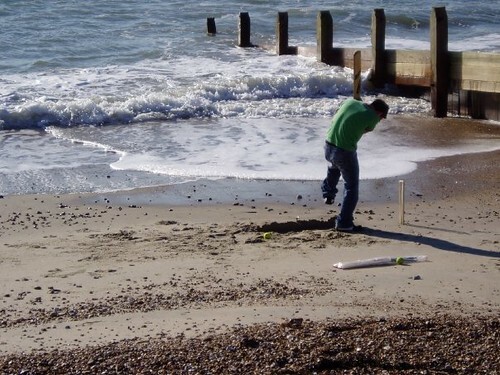 Then one time Dev was into bat, Bob bowled a sneaky little ball which bowled Dev out and the sea promptly engulfed the wicket and attempted to carry the stumps out to sea, (as well as Dev). We managed to rescue them though but tide most definitely stopped play. We went to a nice pub up the road overlooking the sea, (The Ferry Boat Inn, I am informed) and had some lunch. Everybody was very sleepy after the exertions and the sea air, (not to mention last nights booze) so off we toddled back to the executive penthouse apartment to watch Wales beat Scotland in the rugby, (yay!!) and various bits of football on the silly amount of sports channels that you find come with boys flats. We all had a bit of a chill out, talked some absolute nonsense before getting ready for the main event. The oddest convesation of the whole weekend came when we weren’t even drunk. KP announced that there was a place in Canada that had less gravity than any where else on Earth. We did various impressions of what it would be like with too much or too little gravity before deciding it was time we left. 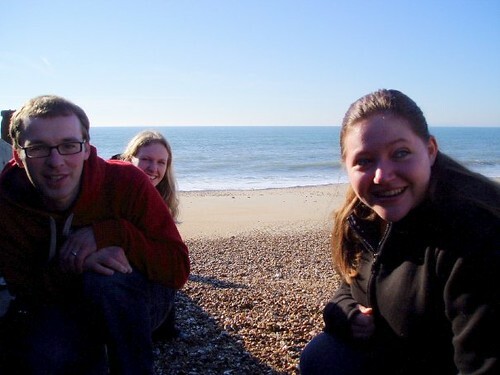 Off we all went into Pompey for a nice drinky before going to the Wedgewood Rooms. I’ve never been to the Wedgewood Rooms before but I think I could possibly get them on trades description. There is only one room really, (unless you count the bogs as an extra one). It is a nice size venue with the obligatory sticky floor, I have a new theory about sticky floors/carpets. I think the floors are deliberately not cleaned and the alcohol etc left to fester to get the nice sticky finish as it helps people remain standing after they have had a couple of drinks. There was a band called Condition on first, they had just been on tour with Paramore. They were rather good, we had a some booze and then watched ‘You me at six’ They were good too but a bit full of themselves, probably as they were about 16 and were just sooo cool with there stupid fringes. Then New Found Glory, now they were excellent. I had only heard a couple of their tunes before but they most definitely ROCKED and I had a little bit of a bop. We then swarmed out of the pub and went to a nice bar. 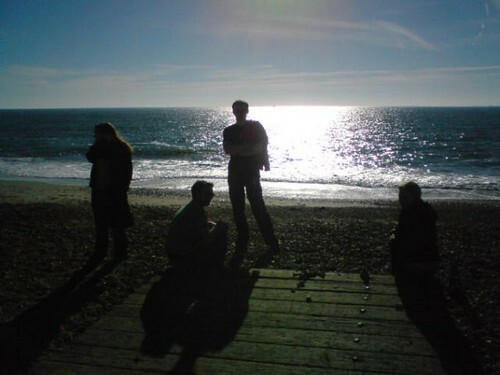 We were all a bit tiddly by this point and ended up arguing about music. Not that this is specifically a drunk thing we do. As I said the next day we could all class our taste in music as Indie/alternative but it is such a huge genre we are never likely to agree on much. We all did agree theta New Found Glory had been very good though. The drunkenness also lead to some extreme sweeping statements in the taxi on the way home too. Mostly about women not being able to do comedy, and sing punk. I disagree as women can do comedy, Jo Brand being an example as far as I’m concerned. And as for punk, well nobody can really sing punk as it is more about the expression in you voice. There are very few examples of proper female punk singers anyway, I think as it doesn’t normally appeal to them as a genre. Siouxie Sioux being the obviously exception. The random statements and heated debates continued for a while and then we went to sleep. Next day more bacon sarnies and then off into Pompey again to go up the Spinnaker Tower. There is great view from the top and one of those crazy glass floors you can walk on. We then did a spot of shopping before going to a Mexican restaurant and embarrassing Bob by asking for a balloon for him, as it was his birthday tomorrow. Well along came a whole bunch of balloons, which got tied to his chair. KP and I took a balloon each and wandered back to the car with them blowing crazily around behind us and hitting people in the face. Off back to the executive penthouse apartment to watch the end of the rugby and then we went home. It was an enjoyable weekend but I am still rather sleepy from the excerptions. I really am getting too old to go to gigs.